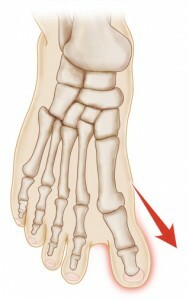 Hallux varus is a common deformity of the big toe, in which the first metatarsal joint of the hallux (i.e., the big toe) deviates away from the foot, toward the body’s midline. Unlike its opposite condition, hallux valgus (bunions), hallux varus, while not uncommon, is not a widespread problem in the developed countries of Western Europe and the Americas. In the developing Third World, however, where much of the population does not wear shoes, hallux varus afflicts much of the adult population. The most obvious symptom of hallux varus is the appearance of the big toe, which bends away from the foot—and in the direction of the other foot—in much the same manner that a hitch-hiker’s thumb bends away from his or her hand. Hallux varus is generally painful, and the pain is generally accompanied by limited range of motion, instability, and difficulty with balance. Patients suffering from this condition may have great difficulty walking normally, or even fitting into shoes. If the hallux varus has been caused by an injury, the condition may appear to become more pronounced when weight is placed on the foot. On the other hand, hallux varus may in some cases be asymptomatic, meaning that the condition is not severe enough to affect the patient’s use of the foot or their general well-being. In such cases treatment is generally unnecessary. Hallux varus may be congenital (meaning that the patient was born with the condition), or it may be acquired via an injury or from long-term wear of inappropriate or inadequate shoes. Injuries that can cause hallux varus include various kinds of blunt trauma or severe burns that cause muscles or tendons to contract. Arthritis or other inflammatory diseases may also lead to hallux varus in some cases. Hallux varus can also result from failed bunion surgery, or it may arise as a complication of an attempt to surgically address polydactyly (extra toes on the foot), or from removal of a sesamoid bone from the big toe. Of all the causes listed here, overcorrection in the course of bunion surgery is by far the most common. How Is Hallux Varus Treated? If mild hallux varus is caught and treated in its early stages, splinting may be beneficial, but in more severe cases this will become less effective as the condition progresses. If the condition is asymptomatic—that is, if the deformity is not too pronounced and the toe is still reasonably flexible—then treatment may not be necessary. There are a number of surgical remedies available for hallux varus, but most of them have similar objectives: releasing soft medial tissue, tightening soft lateral tissue, and transfer of muscle or tendon to correct the deformity. Surgery is also valuable for preventing further complications that might otherwise arise in the future. While you recover from surgery, your doctor will most likely instruct you not to put weight on the affected foot for at least two weeks, and you will be given a cast or surgical shoe to wear. It is very important that you follow your doctor’s instructions while recovering from your surgery; if you insist on continuing to walk around normally, you will risk undoing the surgeons’ work. How Is Hallux Varus Diagnosed? If you suspect that you are suffering from hallux varus, your best course of action is to visit a podiatrist as soon as possible. Your doctor will want to be apprised of your medical history in order to learn whether you have ever had surgery to correct bunions, polydactyly, or some other foot condition. Your doctor will also be interested in your family medical history—for example, whether any of your relatives have ever suffered from hallux varus. My big toe has always bent slightly in this direction; is this anything I need to be concerned about? Will it get worse as years go by, or will it stay this way? My toe has not been the same since I injured it in an accident; is there anything that can be done to remedy the resulting hallux varus? My arthritis has begun to cause me terrible pain in my feet as I have gotten older; what are the chances I will develop hallux varus? Can my hallux varus be treated without surgery, or will an operation be necessary? If we first attempt to treat my hallux varus with conservative measures such as binding, how long will we continue this treatment before we consider surgery? After my surgical procedure, how long will it be before I can resume my normal activities? Can I get by on crutches, or will I need a wheelchair? How long will I need to remain in bed before I can at least become partially mobile?